In today’s networking landscape, it is no longer adequate to have a DNS infrastructure that simply responds to queries. What is needed is an integrated self-protecting DNS architecture that also enables smart growth. DNS is essential to any organization. Without a working DNS protocol, it would be almost impossible to have an Internet of Things that communicate with each other. Without a proper DNS infrastructure, your organization would not have a presence in cyberspace. Ecommerce companies would not be able to sell their services. Even brick-and-mortar companies need DNS servers to advertise their products. In short, the Internet as we know it would not exist. Designing a scalable and secure DNS architecture requires more than increased bandwidth and QPS. 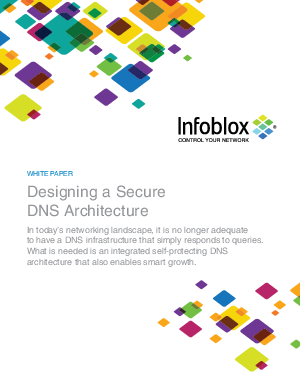 Read this white paper to learn how to build a comprehensive, secure, and scalable DNS solution that ensures availability of essential infrastructure enabling your organization to both grow and protect itself.